An expat’s dilemma: Would getting sick break my bank? It began with my absent-mindedly stepping on a wet tile floor and falling down hard on my right side. It ended with important lessons not only for me but for many others, especially older individuals, who also choose the expat life. In addition, the incident could prove illuminating to anyone who seeks some insight into the complexities of obtaining first-rate medical care overseas, whether tourists or expats. One of the lessons that I learned reinforced the importance of my paying undivided attention to where I walk, especially if I am outside in Phnom Penh. I walk for miles everywhere, in large part for my health, despite the dangers that pedestrians face here. We cannot navigate cluttered sidewalks and must always be on guard in a city where the multitude of cars and two-wheeled vehicles pays virtually no respect to the right of way of pedestrians in seemingly chaotic traffic. Equally important, the whole experience of my fall taught me that I had made the correct decision about medical insurance when I retired to Cambodia from Manhattan at the end of 2013. This randomly photographed clinic is larger than most. 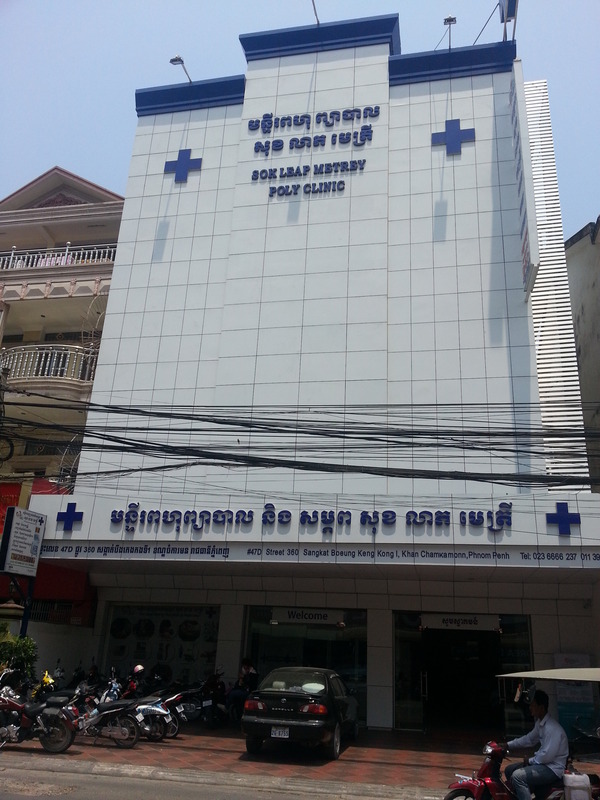 Such clinics can be found all over Phnom Penh. Not even Cambodians defend the quality of medical care in Cambodia. The king routinely jets off to China for checkups, and top government officials also head to other countries for the best care. Ailments that otherwise are treated routinely elsewhere in Asia demand quick flights to Thailand, Malaysia or Singapore. Examples might include a sinus infection, certain bone fractures and diseases that internists in other nations can easily diagnose. A related issued is that no one knows how reliable are drugs with foreign labels, and they fill the shelves of numerous pharmacies.